For those of you that wonder what I do when I'm not coding, I read policy. Woohoo! For example, take the Determination Of Rates And Terms PDF linked at right. It's 98 pages of thick - and sometimes sniping - commentary and decision from the Library Of Congress Copyright Royalty Board on exactly how satellite companies like XM and Sirius are going to pay their royalty payments and submit their reports of use to SoundExchange. Sound familiar? Yeah - it should. Same battle, different battlefield. I'm curious: Ignoring for a moment the obvious data-collection issues, how will XM or Sirius tally their reports of use? In Aggregate Tuning Hours? Actual Total Performances? Unless there's a magic voodoo box that can detect how many XM listeners are on each channel at any given moment, I'm not sure there's a way to calculate either one. As predicted, many people would like to know why a 6.5-8% of gross monthly revenue is OK for satellite services, but Internet Radio is supposed to cough up something in the ballpark of a 35% royalty rate increase. 12.10.2007 - Nokia For The Win! Just in case someone wants to buy RadioActivity.fm an early Christmas present, please feel free to get us a Nokia N95 8gb. Because we're all over their new Internet Radio application. It's free. It's open source. It can stream from any Shoutcast or Icecast-using webcaster. It's pure genius: Internet Radio on the mobile, done right. Contrast this with some of the subscription based, locked-in, "controlled directory" Internet Radio offerings now popping up for Windows Mobile devices. Ugh. As if anybody wants to shell out $6 a month to hear Disney Radio or ESPN recaps. Please. While we've been busy lighting up new stations, we've noticed a lot of stations just starting to use Content Management Systems to run their websites. Using a CMS is something of a no-brainer for many stations, because it eliminates the reliance on a webmaster. They have also evolved to the point where installation and maintenance doesn't require serious technical know-how. What we have noticed is that stations running a CMS are inclined to create and publish more original content as they let their DJ's blog about the CDs and artists they play, as well as the live shows they attend. Just a few examples: KAMP has been posting more artist interviews since they moved to Drupal. KUCR's newly redesigned WordPress website started off with Youtube and Imeem-enhanced show reviews. And SCAD's WordPress site is carrying a lot more original content since they went to WordPress, including concert picks and per-show blogs. It's great to see every one of these stations publishing more and more content on their websites - and all of them are carrying live playlist feeds supplied by RadioActivity.fm. So far we're working well with Drupal and WordPress, and we're working on a Joomla module. But we have to be honest, we've come up with some pretty amazing ideas that tie original content further into station playlists. Without giving all the secrets away, we'll just say we are excited to begin work in this area. I've just rolled up the newest addition to RadioActivity.fm - an HTTP playlist gateway. The gateway allows stations to bypass the RadioActivity.fm web logging interface and put playlist entries directly into RadioActivity.fm using specially formatted HTTP requests. It is intended as a foundation for letting station automation systems 'talk' to RadioActivity.fm. The gateway itself isn't an end-to-end solution, but it is a good starting point for more complete and compliant playlist logging. SCAD has already tied their MegaSeg automation into the gateway, and tied that back to their homepage. It's a good development. Everybody, I'd like you to meet K'Swit, with WRGW at George Washington University in Washington, D.C.
Also: K'Swit is RadioActivity.fm's 1000th DJ. 7.30.2007 - Acronym Soup: I'm headed to the FMC in DC! I'm headed to the Future of Music Policy Summit in Washington, DC, from September 17th to the 18th. If you're headed there as well and would like to meet in person, please drop me a line. I know I'll be attending at least the following sessions: Wireless Media and Super-Portability, Disintermediation 2.0, broadband policy, and policymaking. One of the things I like about the FMC is that they're great about	putting their panel session videos online, for free, almost immediately after each event. If you haven't seen their previous talks, hit their "Past events" pages up for some informative webcasts. What you're looking at is a self-updating piece of Ajax-y code that uses a station's RSS to keep a running, live station playlist. That yellow blink happens every 10 seconds, and means it has just checked for new plays in the RSS feed. When their feed updates, so does this list. This one's tuned into KALX's "Last 10" feed. Any webmaster can have this integrated onto their website in about 3 minutes. We just hit our 14th station signup, and once the invoices are signed and faxed back we'll be adding them all into the stations list. We'd like to say hello to all of our new stations! It's good to have you. If your station has emailed me before today (Monday, July 23rd) about signing on, we'll still honor whatever quotes we sent via email. Just drop me a line and we'll talk. 7.11.2007 - Hey, look, it's all kind of integrated data analysis and reformatting! Many artists are showing up and making direct contact with the DJ's playing their tracks. We like seeing this happen. Thanks to WJCU, RadioActivity's free, online Aggregate Tuning Hours calculator can now parse Windows Media logfiles in order to calculate a station's Aggregate Tuning Hours. This means you can now use our tool to parse your Icecast, SHOUTcast, and Windows Media logfiles simply by clicking here and following some instructions. Don't forget we've also churned out a couple of articles on the subject, if you are wondering why this is important and are looking for a starting point. Automation	is also becoming a bigger and bigger issue, and I'm working with some stations now to do some interesting things with their automation logs. One, for example, is taking BSI logfile output - output which often lacks key fields like album name or label name - and playing 'fill-in-the-blank' by doing some intelligent data mining of station records. We're getting pretty good at taking input A, running it through some logic, and getting new and improved output B. With all the drawn-out CRB stupidity still playing out in court, it's hard to note any positive advancements in the webcasting realm, but I'd like to point one out here: Artists have started noticing their airplay in RadioActivity.fm playlists and have been emailing the DJ's directly to say 'Thanks!'. If there's one good thing to come out of the next eight months, it's going to be increased artist-to-station interaction. This sort of relationship demonstrates exactly what the powers-that-be don't understand - the direct, demonstrated, non-financial benefit to artists when webcasters play their works. Raising royalty payments only muscles people out of the game, which, as many folks have pointed out, was probably the point from the beginning. We're already hooking in RadioActivity.fm features to help encourage this artist-to-DJ contact, because it's probably one of the few things left that can save internet radio. David Byrne completely nails it on the Copyright Royalty Board fiasco. It points to another victory for the oligarchs � the big 5 record companies and the media companies that own them. Count one more for the big guys. The reasoning that it�s for the benefit of the artists rings a little hollow as most artists heard this argument re: cracking down on file sharing, and most never see money from their record companies anyway � so the line about �we�re doing it for you� is pretty suspect. The good news is, RadioActivity.fm can output properly formatted SoundExchange Reports of Use reports for our customers. The bad news is, even with RadioActivity.fm's help, the process is still complex enough to require a little training and guidance. I have documented my experiences creating these reports in a series of articles and videos, and am running thorough the generation and submission process with stations one-by-one. For those of you unfamiliar with the PERFORM act, please take ten minutes out of your day to read a couple of links. ... buried in the bill is a provision that would effectively require music webcasters to use DRM-laden streaming formats, rather than the MP3 streaming format used by Live365, Shoutcast, and many smaller webcasters. The PERFORM Act would change that, requiring webcasters to use DRM that restricts the recording of webcasts. That means no more MP3 streams if you rely on the statutory license. This is so stupid it causes me actual physical pain. I highly encourage you to review the following links and/or contact your congressperson to express your opinions on this matter. Christmas just came a little later this year at RadioActivity.fm, where our third server just arrived fresh (and just a tad behind it's delivery schedule) from Dell. This one's slated to be our secondary reports cruncher, backup database mirror, and a nonpublic development host. Lots of people are talking about playlist logging these days. I have fielded some more questions I would like to share. Some stations stations are telling me: "We have an I.T. person, we can run a webserver, we're all pretty tech-savvy - why don't you just make RadioActivity a downloadable program for us to run locally?" I respect where these stations are coming from. There are certainly some other free/open-source playlist-logging apps floating around, and since I started RadioActivity I've seen roughly two dozen stations that have their own internal playlist systems, with varying feature sets. I respect that most stations have a fiercely independent DIY way of doing things - and thus would rather solve problems in-house than farm them out to a 3rd party. I also respect that some stations inherently shy away from paying someone 'outside' to do something they think they can handle internally. 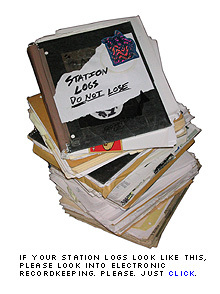 Your station may have a great I.T. person now - but what happens when they leave? And what are the odds that the next I.T. person's skill set will match the previous I.T. person's skill set? Most small-market stations are working with insanely tight budgets, and thus their computing technology leans towards consumer-class machines that lack "server-class" features. Take a quick look at your 'critical' station computers. What if the hard drive crashes? Is it running on a RAID array? Does it have a nightly tape backup? Redundant power? Is it even your server - or are you using a shared or campus computer resource? Do you even know who runs the machine, who to call when something breaks? One of radioactivity.fm's more popular features is its ability to compile reports based off of raw playlist data - top 10's and the like. Because this data came from the DJ's, there's a lot of 'fuzzy matching' and data cleanup that takes place. This sort of thing eats up computational power at a startling rate. Running this sort of intensive process on a consumer-grade (or shared) computer is not going to be anywhere near as fast as running it on the radioactivity.fm server stack. These are just a few of the reasons I have not released RadioActivity.fm as a downloadable package for local use by stations. As always, I welcome your comments. For any of you that may have missed the Wired Article 'Gracenote Defends Its Evolution', take ten minutes out of your day and read this one. The Slashdot comments on this one are pointed, funny, and honest - others are more to the point. Remember, all in all we're talking about a few CD's worth of data. That people would close it up, monetize it, antagonize their contributors and hoard such a resource for their own advantage provides a pretty clear example of how not to operate. a) Does RadioActivity work with our existing automation system? b) How does RadioActivity address the changing SoundExchange recordkeeping requirements? c) Can my station beta test RadioActivity for a while to see if it meets our needs? Right now, RadioActivity runs purely on human input - mainly, DJ's logging their playlists directly into the RadioActivity web interface. I have been experimenting with different ways to tie RadioActivity into specific automation setups, but unfortunately there are many different automation systems out in the world. As a rule of thumb: if your automation setup has some sort of 'live export', it can probably tie into RadioActivity. However, some automation setups only report a subset of the data that RadioActivity collects and crunches. For example, a typical automation export can report artist, track, and album name - but RadioActivity also collects genre and playtype to assist with report generation. So this is one of the kinds of issues that come into play when talking about automation. If you have specific questions or comments about your automation setup, please feel free to contact me. Many of you have asked me about RadioActivity.fm with respect to the proposed content and formatting changes to the SoundExchange webcasting reports. The short answer to your question is this: RadioActivity can handle the formatting part of these proposed changes with little difficulty whatsoever, allowing you to submit your reports via FTP, CD, or email. This specific reporting is on track to become a basic administrator function within RadioActivity once the recordkeeping changes are finalized. As to the content of the reports themselves - RadioActivity currently handles about 85% of the required fields. Two fields in particular ("ISRC code" and "actual total performances") are problematic, but I have some innovative ideas for dealing with that last 15%. I cannot discuss them further until a couple of different things happen - and some different people weigh in on the specific way I seek to handle these two fields - but the upshot is this: I'm working on it. In short, RadioActivity seeks to make these reports as simple as clicking a button, so stay tuned. Of course. All you need to do is contact me so I can touch base with you, and I will be happy to set you up with an evaluation login. For those stations running the Icecast streaming media server, you may be interested in openradiodirectory.org. Openradiodirectory.org is a free, Icecast-compatible Yellow Pages (YP) server. For those of you unfamiliar with the concept - you can configure your Icecast server to 'talk' to openradiodirectory.org, and your server then 'advertises' its broadcasts to the public, along with stats like current listeners, current song, etc. to help listeners find your station. This is one of about 3 public Icecast YP servers in existence, and I've added some extra bells and whistles like RSS and a "last 25 tracks" feature. Directions for listing your stations are found here. 11.10.2006 - A RadioActivity.fm blog?